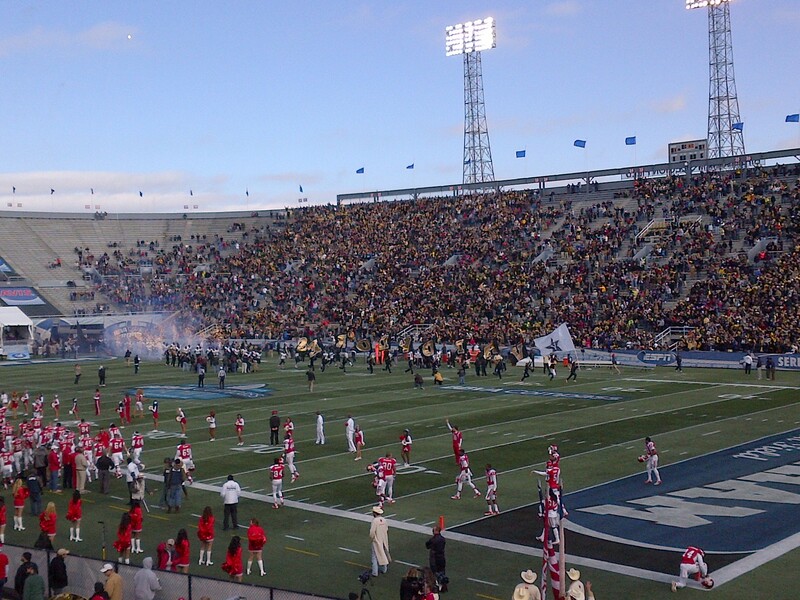 As reported, we went to watch Vanderbilt and Houston play in the Compass Bowl on Saturday, and from the start, my first trip to Birmingham did not disappoint. Arriving into town, I had my first new experience of the day: a traffic jam of cars decked out in Commodore regalia trying to get into the game. Some people complained about logistical failures surrounding the game, but I saw none, and this traffic jam was a good sign of the growing support of the program. ALDLAND was in Nashville last weekend (as if it isn’t always there) for the Florida-Vanderbilt game and sundry Music City revelry. I was at the game on Saturday night. Bdoyk could not take a break from forty-eight straight hours of honky tonking to attend. Magalan was supposed to be in the stadium too, sitting a row behind me, but I never did spot him on the inside, which likely was due to my inability to visually identify him in his Gator colors. The Vanderbilt defense seemed to encounter the same challenge, demonstrating difficulty stopping the Florida run game in general, and mobile quarterback Jeff Driskel in particular. In my game preview, I suggested that the relevant analogy for this VU opponent was Georgia. Instead, the game probably was more similar to Vandy’s game earlier this season against Northwestern. While the Dores grabbed an early lead in this one, they were unable to maintain it. Still, the game was exciting throughout, the home team rarely beyond a one-score deficit until Driskel’s back-breaking touchdown run at the end of the game. A bright spot for VU was wide receiver Jordan Matthews, who had eight catches for 131 yards and a touchdown. The spotlight also shone on Coach Franklin and his staff, though, and the Commodores’ inability to run plays quickly at the goal line late in the game was a little concerning. Still, in a game in which Driskel topped Tim Tebow’s school rushing record, the little things aren’t going to be outcome-determinative. One last printable highlight of the weekend came before the game started, when top golfer and Vanderbilt alum Brandt Snedeker stopped by our tailgate for a chat with some of his old buddies on his way into the game.